Apple flew contest winner Chunli Fu to the company's headquarters in Beijing to collect her $10,000 Apple Store gift card for downloading the 25 billionth app from the iTunes App Store. After being announced the winner earlier in March, Fu last week received the promised $10,000 gift card in person at Apple's Beijing corporate headquarters that is some 400 miles away from her home city of Qingdao, China, reports M.I.C. Gadget.. Previous to winning with a download of the free version of Disney's "Where's My Water?" app, Fu was not a dedicated Apple fan and only owned her iPhone for about one month. 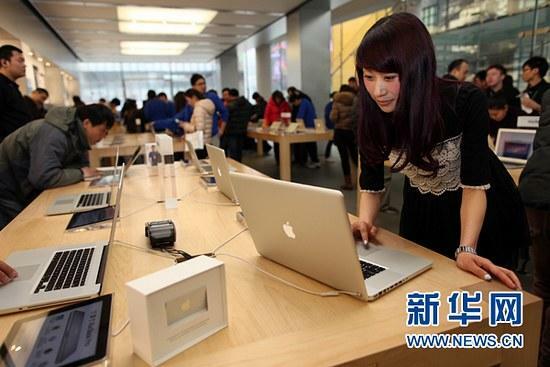 Now referred to as the "Apple girl" by the Chinese media, Fu wasn't aware of the contest and though that Apple's initial congratulatory calls were pranks. Only after receiving an email from Apple Inc. did Fu believe what her friends had been telling her. Fu took her $10,000 in credit to the Apple Store in Sanlitun where she browsed various products and was photographed inspecting a MacBook Pro. It is unclear what, if anything, Fu purchased. China has become Apple's most important market outside of the U.S. as a burgeoning middle class take an increasing interest in the company's products. It was reported on Monday that Apple CEO Tim Cook was in China engaging in talks with officials over undisclosed topics, though insiders say that he is there primarily to discuss a next-generation iPhone.